Under the Dome has had considerable luck this season – at any other time it would be the worst show I’ve been watching, except Falling Skies has also been inflicted on us. 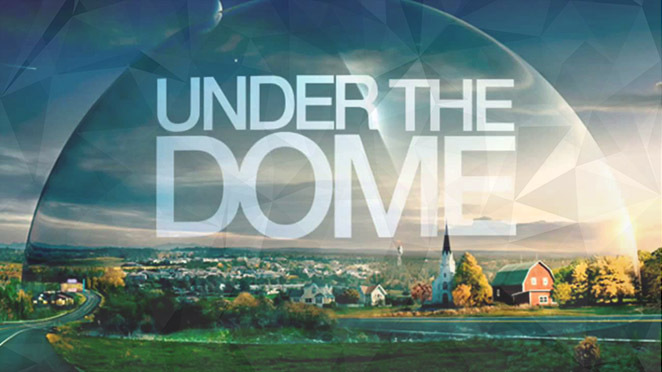 Now Falling Skies has been cancelled, Under the Dome can claim the title of Worst Ever. I regret him not killing the demon child with fire. And Julia. Julia manages to convince Barbie to wait to try the cure – since neither of them know the cure doesn’t actually work. At team resistance, Lily talks to Jim about his mass murderer solution – and she tries to talk Jim out of it by appealing to his better nature. This is the lady who worked surveillance on the dome but still thinks Jim has a better nature. She wants him to convince Hector to be all good. He agrees – but only to get her co-operation. He wants her to erase the spy footage of him since it shows him doing all kinds of murdering. Hector pours away his poison. Alas, another good idea is banished. Over to the Kinship and an ailing Christine is draining more energy from the Dome – speeding the Calcification – in order to power up Demon Baby. But the whole Dome is now starting to calcify far far far too fast. Everyone will die. Remember this is a bad thing. Apparently. They go back to base and Junior tells them all about the attempted cure. They recap each other and Junior is now all jealous of Sam while Christine is still aging. And people are starting to suffer oxygen deprivation. But only some of them for REASONS. Anyway the Dome needs to come down as soon as possible. So she wants an answer from Joe right now because, yes, again, Joe is the one who absolutely must save them all: though Joe remembers the death threats Christine has happily dished out in the past. Sam and Junior take a line of old people and have them march into the lake. Norrie checks with Joe and he tries to get her to leave as soon as the Dome comes down but Norrie, having something similar to common sense, doesn’t trust Christine not to just kill Joe. Christine is with the newly cocooned queen evil demon baby transferring the last of her life into the new queen. She’s joined by Barbie and Julia (there’s only one guard, of course there is) who interrupts, breaking open the cocoon – and a blurred form rushes out of it. Barbie runs after his evil demon daughter, leaving Julia with a weeping Christine. For a brief second, Barbie even looks like he’s going to shoot his demon daughter before he loses her and returns to Christine and Julia. He doesn’t quite grasp that the blurring thing probably was his daughter because he still thinks she’s human despite immense evidence to the contrary. Barbie gets all angry at Christine but Julia goes all wet and fluffy and protests at evil alien abuse. Christine weeps and apologises. She’s apparently cured, she’s human so she doesn’t get murdered. Also she transferred all her knowledge to the new Queen so she doesn’t even know much about the master plans… but she does belatedly remember the lake and the massacre she ordered there. He tries to kill her but, sadly, Barbie decides to attack – only Junior is now all super-aliened and not easily beaten and Barbie has to be saved by Julia. Oh the shame Barbie, the shame. More shame. Can they at least hit Junior a few more times to see if he’s dead? Back at the Resistance, Hector’s assistant Dava is not all that thrilled by Hector’s plan of mass poisoning and he pulls a gun on her to stop her telling Julia. See, Julia is the source of all the world’s problems! Lily finds Dava’s body with Hector stood over her. That pretty much destroys any chance of a cure. Lily is outraged and thinks when the Dome is down all these poor sick people will be quarantined. Hector doesn’t think a gentle quarantine is in the future of people infected by an alien invader. She then sees Hector’s plan – not kill the town, kill Joe, stop the Dome coming down and save the world from the aliens. While Hector ties Lily up she manages to tell Hunter and Norrie Hector’s plan – who in turn tells Jim who is busy packing lots of money to run away. Jim is quite annoyed by the whole thing and decides to go save Joe so they can actually get out. Hector and his forces attack the burned down radio station where Joe is setting up his Dome breaker but before the soldier can kill Joe, Norrie shoots the soldier repeatedly. They turn to run and run into a gun wielding Hector. And he is shot by Big Jim. He protests that he’s saving the world and Jim shoots him in the head. The Resistance all gathers – and Barbie and Julia bring back Christine because it’s not like an alien has pretended to be human to gain information and their location before, right Sam? They also realise with Dava’s dead then they’re utterly screwed. But hey they have Christine, I guess. About damn time! Kill it with fire!!!!! And Christine is captured – by the new queen! She plasters Christine to the Dome and reduces her to sparklies. Apparently the old queen has to die. I think Hector may be the most compelling character on this show. Hi desperate guilt and torment, his need to make it right because of his assumed responsibility. His story could be immensely more interesting than Julia’s. Or Jim’s. Or Barbie’s. But no, he dies. Something I have been predicting ever since he appeared because this is Under the Dome and Black people die under this dome, it is known. Julia (who has made so many bad decisions by now that she should die from her brain melting if nothing else).